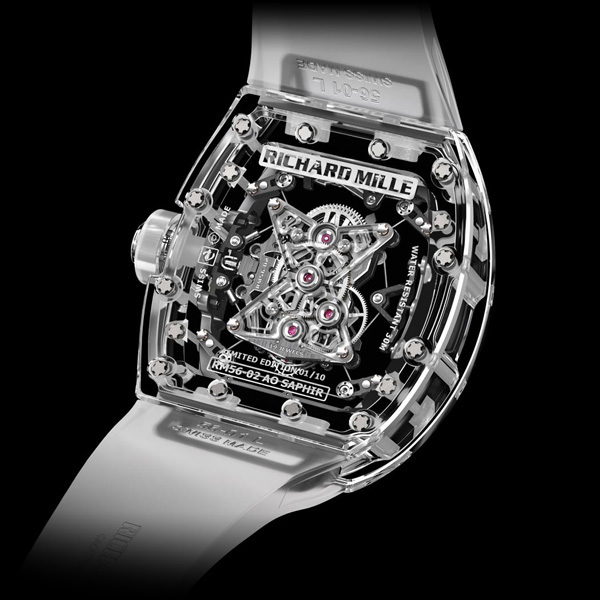 At Richard Mille, the fact that a tremendous challenge has been won is never a valid reason to stand still and be complacent. The introduction of the RM 056 Sapphire Tourbillon Split Seconds Chronograph three years ago was a watchmaking milestone of technical achievement; never before had such a complex case design for such an intricate movement been manufactured in pure sapphire. This debut was followed by the RM 56-01, which put the stakes even higher with a baseplate, bridges and third wheel additionally created from sapphire. Today, a cutting-edge expression of horological transparency created expressly for the Watches & Wonders event in Hong Kong is presented with the magnificent RM 56-02 Sapphire Tourbillon and its new movement, taking cues from the mechanical architecture of the RM 27-01 Rafael Nadal and its cable suspended movement. By incorporating this cabled movement design within a world of transparent sapphire, an ultimate expression of weightlessness and transparency is evoked within the world of extreme horology. 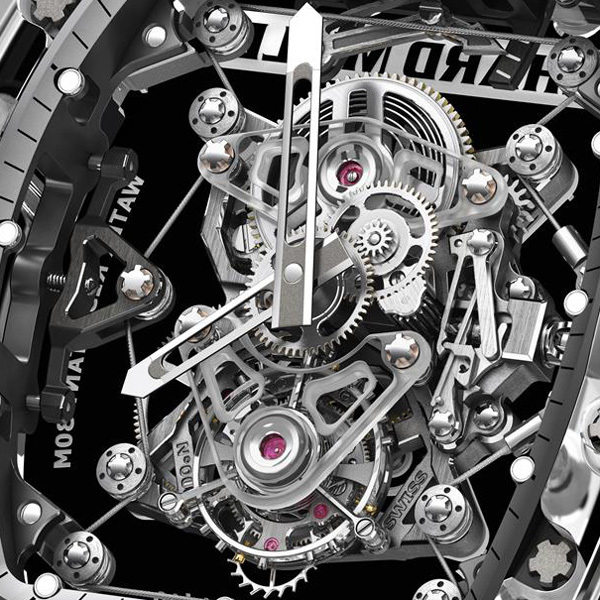 In this fashion the baseplate of the RM 56-02, created from grade 5 titanium, is entirely suspended within the sapphire watchcase by specially developed single braided cable of only 0.35mm thickness, woven within a system of 4 pulleys on posts at the movement’s corners and another 6 pulleys placed along the movement’s periphery. The tension of the cable is perfectly controlled by a miniature ratchet at 9 o’clock. This entire cable unit is attached to a separate indicator located below 12 o’clock allowing an easy visual inspection of the cable tension, to ensure that it is always operating within the designated norms. 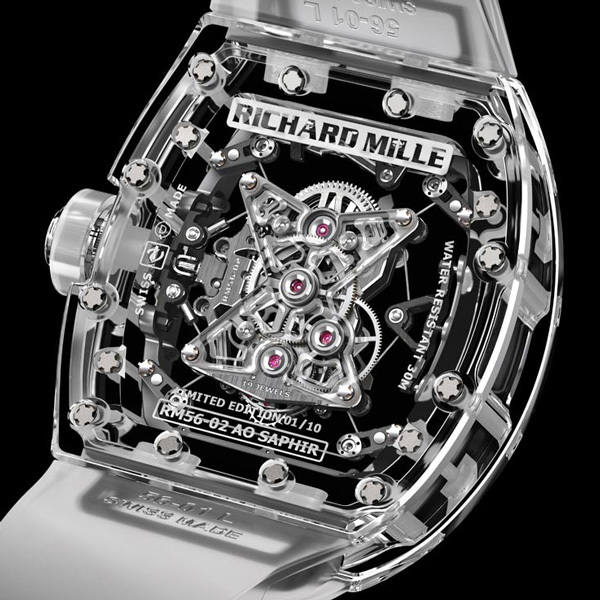 Other parts of the movement have also been optimized for transparency thanks to the experience gained with the aforementioned versions; in this case Richard Mille’s engineers have added to the previous use of sapphire movement parts a new design of winding barrel bridge, tourbillon and center bridges in sapphire. 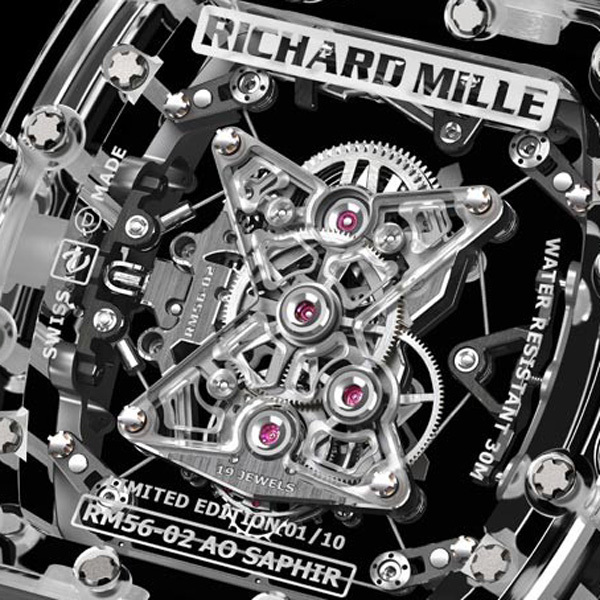 This fluently executed technical challenge is a crowning achievement of the sapphire family of timepieces within the high scaled variety of creativity to be found within the Richard Mille collection as an entity. Sapphire, created from subjecting aluminum oxide crystals (Al2O3) to high pressure and temperature environments, is transparent due to the purity of its composition and has a hardness of 1800 Vickers (9 Moh’s) making it virtually scratch resistant by materials other than diamond. 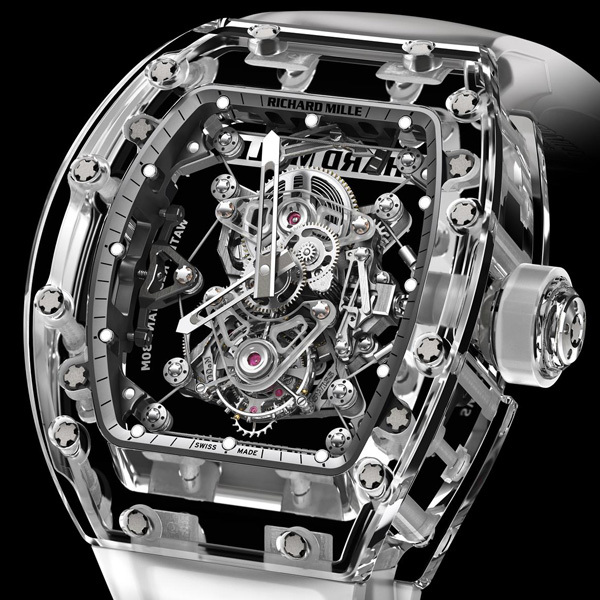 The tripartite case of the RM 56-02 is milled and ground from blocks of solid sapphire by the prestigious and highly specialized experts Stettler in Lyss, Switzerland, who had the difficult task of creating these movement parts and the unique, wrist hugging, ergonomically curving tripartite Richard Mille case. These engineering and technical challenges are self evident when we examine the reality of creating something inimitable like the RM 56-02: 40 days, 24/7 of continuous machining are required in order to produce one case followed by 400 hours of machining and finishing for the different movement bridges. The case of the RM 56-02, with anti-glare protection on both front and back bezels, is waterproof to 30 meters thanks to the utilization of two transparent nitrile O-rings assembled with 24 spline screws in grade 5 titanium. The partially translucent strap created from Aerospace Nano® by Biwi SA, exclusively for Richard Mille, provides a silky and almost organic responsiveness to the skin that perfectly complements the exquisite ergonomic perfection of the RM 56-02 on the wrist. 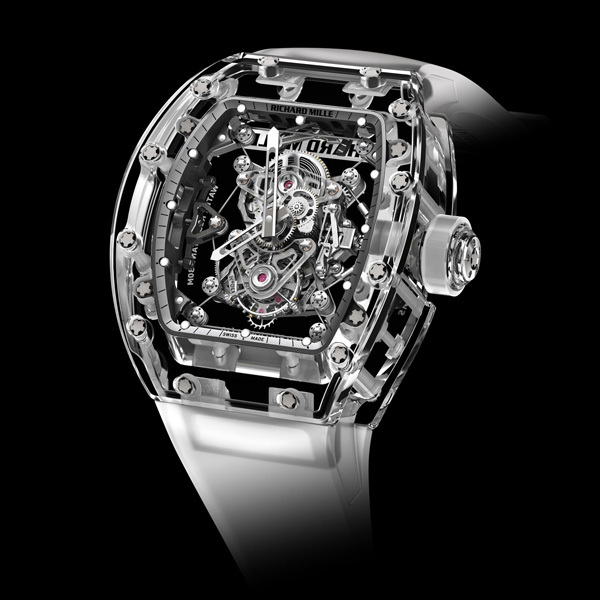 The RM 56-02 will be released in a limited edition of 10 examples worldwide.